The Verdict: Fun, charming, delightfully over-the-top. Only six issues long, so not enough time for much character development, but Michelinie still manages to make them likable enough that you’re fond of them by the end. Blevins’s art matches the tone of the stories perfectly. Worth the cover price just for issue 3, but thoroughly enjoyable throughout. Exposition! Accents! Friends doing cute things with magnifying glasses! 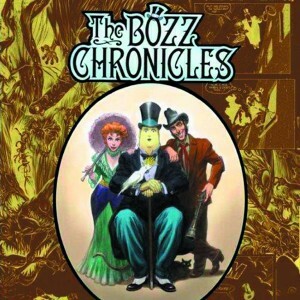 The Bozz Chronicles is the story of Bozz, a big, yellow, highly-intelligent alien who crash-lands on Earth in Victorian England. Seeing no hope of returning home, he attempts to kill himself, but is stopped by a prostitute named Mandy. She befriends him and is the Watson to Bozz’s Sherlock, or perhaps the companion to his Doctor. Mandy and Bozz set up shop as consulting detectives, which keeps Bozz occupied enough to not be suicidal, and keeps Mandy off the street. Soon they are tackling cases involving immortality machines, botched magic spells, demons, alien spacecraft and, my personal favorite: Victorian Andrew Ryan (See: BioShock). Not bad for six issues. Did I mention the Texan? There’s also a Texan. He handles the punching side of the business. I’m not sure where he’s keeping his lasso. 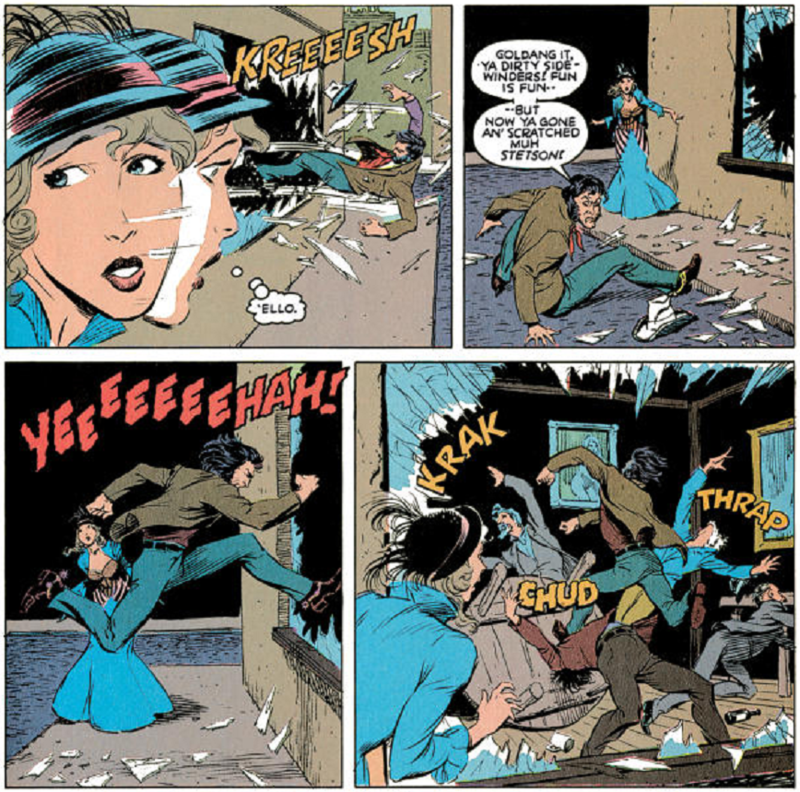 The book reads as a love letter to campy, over-the-top horror comics – a genre that I have a particular affection for. Writer David Michelinie might know a thing or two about those: He wrote for DC’s House of Secrets early in his career, as well as writing seven issues of pre-Alan Moore Swamp Thing (#14-18 and #21-22). 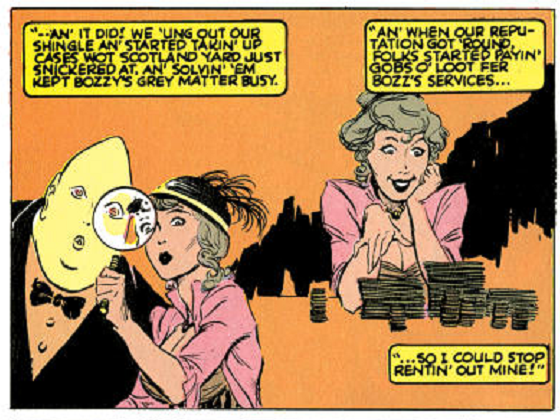 Being a fan of both pre- and post-Moore Swampy, Bozz felt pleasantly familiar to me. Think campy old movies/TV shows. The characters are archetypal but likable, everyone is written in dialect (with outrageous accents, I might add), the villains are often defeated with a silly deus ex machina; my favorites include a lasso and a bucket-wielding Oliver Twist. “Over-the-top” only beings to describe Bozz at some points, but Michelinie and Blevins were clearly having a blast creating the story, and their enthusiasm is infectious. And here we see Victorian Andrew Ryan and his Time Shooter. Seriously, someone check Ken Levine’s bookshelf for BozzChron (that’s what we’re calling it now). If all that madness sounds like fun to you, you’ll have as much fun with The Bozz Chronicles as I did. If it doesn’t sound like fun to you, well, we probably can’t be friends. The Details: This first collected edition of The Bozz Chronicles is part of Dover Publishing’s new graphic novel line and features introductions by David Michelinie and Bret Blevins as well as a foreword by Brandon Graham, an afterword by John Ridgeway, and a bonus artwork and cover gallery. It hits stores September 16th and is available for pre-order now. I am late... to everything!! !